Meet our crew! Back row left to right: Jodi, Trent, Brian, Tracy, Eric, Ross and Richard. Front row left to right: Richard Hastings (Owner) Tiffany, Jess, Christy, Audrey and Sandy Hastings (Owner). 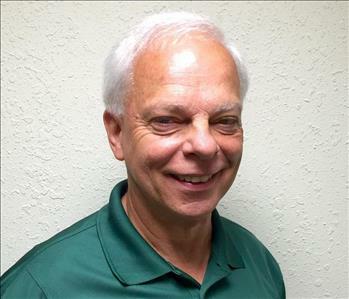 Richard Hastings is the owner and Vice-President of SERVPRO of Cape Girardeau & Scott Counties. He is WRT, ASD, and FST certified. 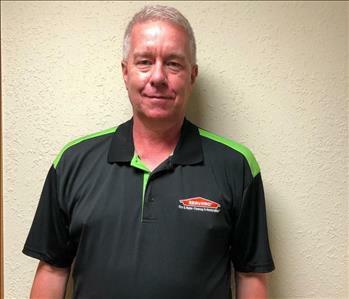 In 1980, Richard started working with SERVPRO in his home state of Delaware and has been at the Cape Girardeau franchise since September 1992. He works alongside his wife Sandy and now his daughter Brittany. His other daughter Sara lives in Delaware along with his grandson Hunter and son Brian (d.2015). Richard is involved in both the Cape Girardeau and Jackson Chamber of Commerce, Cape Girardeau Kiwanis Club, and New McKendree United Methodist Church. He enjoys traveling with family and friends and watching the St. Louis Cardinals. He relaxes by cutting the grass because it gives him time to think and be alone. Along with being the Vice-President of the local franchise, Richard is also the State Director for Missouri. Sandy Hastings is President and Co-Owner of SERVPRO of Cape Girardeau & Scott Counties and has been here since March 1993. Sandy is involved in the following community organizations: Zonta of Cape Girardeau, P.E.O., Cape Girardeau Evening Lions Club, Cape Girardeau Area Chamber of Commerce, Jackson Chamber of Commerce, Better Business Bureau Board, Leadership Cape Girardeau (Liaison, Leadership Development Committee), New McKendree United Methodist Church (Chancel Choir, Love Handbell Choir, GO Team), and Sikeston BNI. 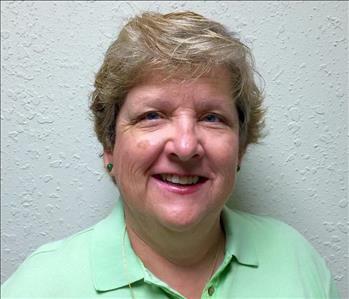 Sandy enjoys working in the garden and being outside, helping with children’s programs at church, going on mission trips to Haiti, and attending plays, musicals, and St. Louis Cardinals games. Along with being President of the local franchise, Sandy is also the State Director for Missouri. 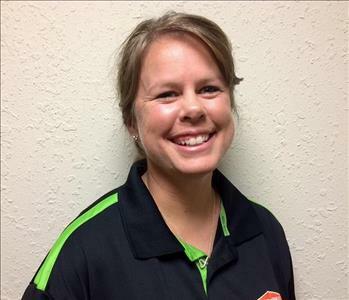 Jodi Stafford is the Office Manager at SERVPRO of Cape Girardeau & Scott Counties. She joined our team in November 2007 and has certifications in Xactimate, WRT, FSRT, ECTP, Quickbooks, and Drybook. Prior to working at SERVPRO, Jodi worked in retail, which taught her the importance of customer service: “Customers have a lot of choices…to set yourself apart, you have to provide excellent customer service. Sometimes that is the only difference between you and the other guy.” Jodi is a member of Jackson Noon Optimist. She and her husband Jay have two daughters: Rylee and Tatum. When she is not at work, Jodi likes to work on her yard and do arts and crafts—making wreaths or flower arrangements. Jodi also enjoys walking trails and hiking. Over the past few years, their family has been given the chance to travel together while watching their oldest daughter play school and traveling basketball and soccer. 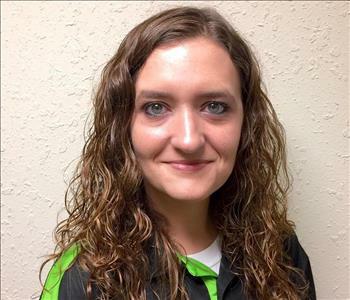 Christy Moore is an Administrative Assistant for SERVPRO of Cape Girardeau & Scott Counties. She is ECTP and WRT certified and has an Associate’s Degree in Business Administration. Christy has been a part of our team since February 2013. Her previous work experience in retail management and insurance have equipped her for this position because she not only excels at customer service, but she also has an understanding of how the insurance industry works. Christy is a member of the Jackson Noon Optimist Club. There is nothing she loves to do more than spend time with her best friend and love Kevin and their kids Brendon and Lexi. They enjoy camping, going on walks, watching movies, and simply being together. Their family also includes Kitty, Duke, and Gibson—their three cats. 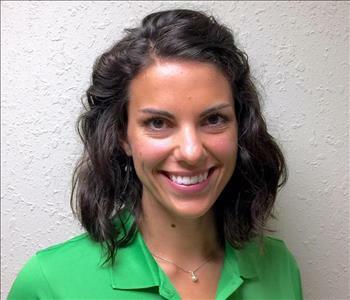 Brittany Davenport is the Marketing Manager at SERVPRO of Cape Girardeau & Scott Counties and has also been recording local radio and television commercials for us since 2004. She is certified from the IICRC in WRT (Water Removal Technician) and FSRT (Fire and Smoke Restoration Technician). Brittany and her husband Mac recently moved back to Cape Girardeau from Chesterfield, MO after she completed her Master of Arts degree. They have a playful pup named Kahlua that keeps them busy, and they now have a son that was born in September 2017. Outside of work, Brittany enjoys singing, theatre, playing with Kahlua, watching the STL Cardinals, traveling, spending time with Mac, and growing her relationship with Christ. 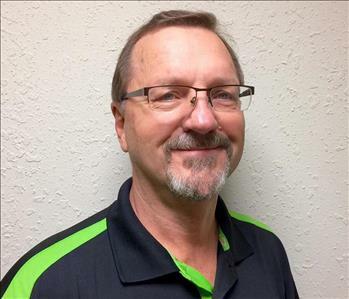 Tracy “Lou” Loughary is the Estimator at SERVPRO of Cape Girardeau & Scott Counties. He joined our team in March 2010 and is certified in XActimate, WRT, SRT, ASD, and RRRP. When he is not at work, Tracy enjoys riding his Harley or Can-Am, hunting, fishing, and kayaking. 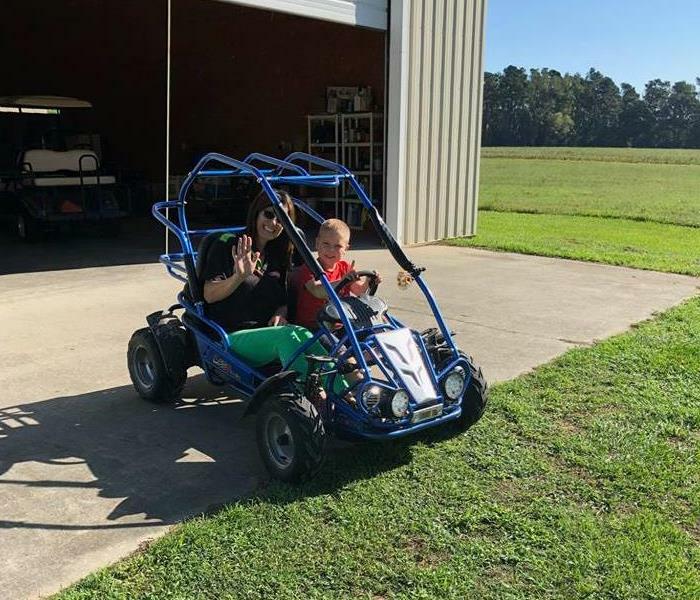 Together, he and his wife Melynda have five children: Shay, Coleton and Haylee Loughary and Allyson and Olivia Jansen. They also have a Saint Bernard named Chrome. 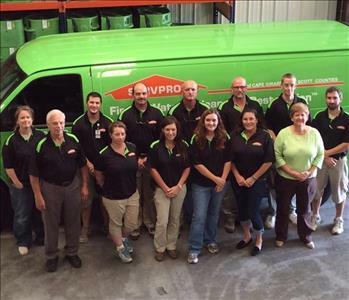 Dan Zembsch is the Commercial Accounts Representative for SERVPRO of Cape Girardeau & Scott Counties. He joined our team in January 2016 and is WRT certified. His previous experience includes office furniture contract sales, twelve years of space planning and design, two years of home furniture sales, and fifteen years of residential and commercial construction. Dan is locally involved with the Cape Girardeau Area Chamber of Commerce, Jackson Chamber of Commerce, Leadership Jackson, and is an ambassador for United Way. He and his wife Sarah have a son named Joseph and daughter named Anna Mae, a cat, and two chinchillas. Dan enjoys going to and watching sporting events and is an avid football, baseball, basketball, and college wrestling fan. He and Sarah love to go hiking at Cove Hollow at Cedar Lake and love live music, especially Classic Rock. Bryant “Mac” Davenport is the Operations Manger and has been with us since August 2016. He is WRT, FSRT, and ASD certified by the IICRC and previously worked for SERVPRO of West Kirkwood and Sunset hills for six months while he lived in St. Louis and worked as a Crew Chief for SERVPRO of Cape Girardeau and Scott Counties. He also works as a Franchise Business Consultant for the SERVPRO franchises in the St. Louis area. He and his wife Brittany have a son along with a lab/shepherd/boxer mix named Kahlua. He is currently pursuing his Master of Theology online through Midwestern Baptist Theological Seminary. When he’s not at work or doing school work, he enjoys spending time with family, watching and playing sports, playing with his dog, reading, writing, and serving Jesus. Ross Friese is a Crew Leader at SERVPRO of Cape Girardeau & Scott Counties. He joined our team in September 2015 and is WRT and FSRT certified. His previous experience includes working for the City of Cape, Parks and Recreation Department. Ross enjoys spending time with his son Marshall and fiancée Aimee. He attends St. Paul Lutheran Church and has a cat named Genesis. Ross likes listening to music and is an avid reader of both fiction and non-fiction; Ross has read every Stephen King book. He also enjoys team sports and Formula 1 Racing. Jessica Blue Moore is a SERVPRO Marketing Rep (SMR), formerly Crew Leader, for SERVPRO of Cape Girardeau & Scott Counties. She joined our team in August 2015 and is WRT and ECTP certified. Jessica’s strong drive and attention to detail makes her a valued team member. Together, Jessica and her husband Randy have four kids and a grandson. They also have two dogs and two horses. Outside of work, she and her husband enjoy hunting, fishing, camping, and riding horses. They also enjoy spending time with their grandson on the weekends. 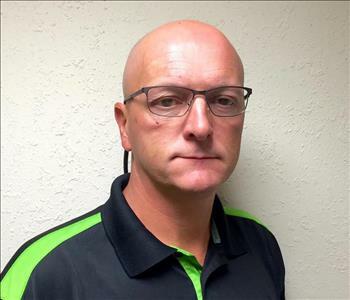 Richard Landers is a Production Technician for SERVPRO of Cape Girardeau & Scott Counties. He joined our team in May 2015 and is WRT and ECTP certified. Richard’s strong drive and attention to detail makes him a valued team member. Richard and his wife Sarah have a son, Heath. They also have two dogs and two cats. When Richard is not at work, he likes to play sports, hunt, fish, skydive, and spend time with family and friends. 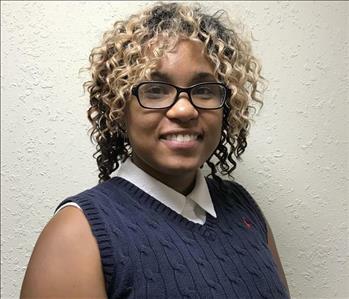 Kaleisha Walker, native of Cape Girardeau, is the Marketing Support Coordinator (MSC) for SERVPRO of Cape Girardeau & Scott Counties. She has a background in marketing, radio and fashion merchandising. She has more than seven years of marketing experience. She received her Bachelor of Science degree from Southeast Missouri State University in May of 2011. Kaleisha said one of her goals is to help the Cape Girardeau Franchise grow, succeed and exceed business goals. When Kaleisha is not working, she enjoys listening to music, spending quality time with family, expanding her skill sets, learning with continued education (to better both her personal and professional development) to be of better service to her employer, volunteering in her community, helping others, modeling, praying and reading her Bible to get better acquainted with her Heavenly Father. 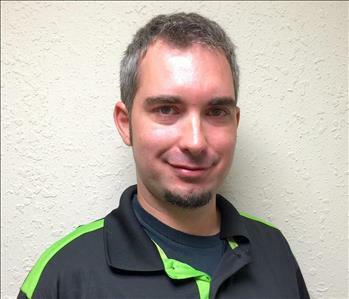 Trent Sizemore is a Production Technician for SERVPRO of Cape Girardeau & Scott Counties. He joined our team in June 2018, but he has worked for us before in the past. He is WRT and ECTP certified. Before his career at SERVPRO of Cape Girardeau & Scott Counties, he worked at Jackson High School as a custodian for one year. Trent’s loyalty and hard work make him a valued hero, and we’re so happy to have him part of the team. 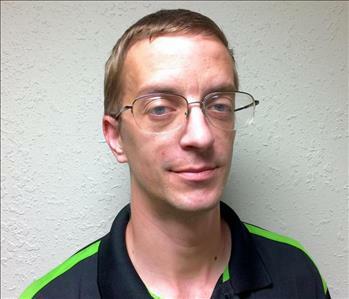 Kristopher Sander is a Production Technician for SERVPRO of Cape Girardeau & Scott Counties. He joined our team in August 2018. Before his career at SERVPRO of Cape Girardeau & Scott Counties, he did construction work, built houses, and operated heavy equipment. Kristopher has a wife, Brittany, and two children: McKinnley and Gabriella. He is heavily involved with his church and the Dad’s Club. In his free time, he enjoys spending time with his wife and kids, working out, being outdoors doing fun activities with family and friends. We’re so happy to have him on the team as one of our valued heroes. Chad Miller is the Production Manager for SERVPRO of Cape Girardeau & Scott Counties. He joined our team in January 2018. Chad is WRT, ASD and OSHA 10 certified. Prior to his career here, he was the Area Manager for Dish Network. And, he has 13 years’ experience in the field working with customers on a daily basis. Chad is happily married to his wife, Jennifer Miller, with a lovely daughter by the name of Jennica Miller. They also have two fur babies (doggies) by the name of Tank and Stitch. When Chad is not working, he enjoys spending time outside or in the garage. He enjoys working with his hands either by building or fixing. We’re blessed to have Chad part of our team. Michele “Miko” Jackson is our Job File Auditor here at SERVPRO of Cape Girardeau & Scott Counties. She joined our team Oct. 01, 2018. Michele received her Associate’s Degree in Applied Science in Business and Computers. Prior to her tenure here, she was a Service Representative for a local hotel and Administrative/Personal Assistant for a local reverend. Michele has two lovely children: a son named Montell Jackson and a daughter name Mena Jackson. 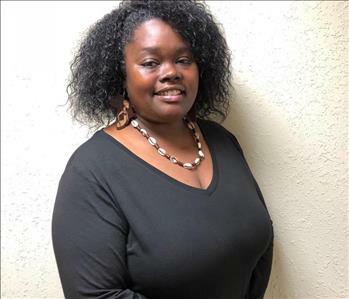 She likes to stay involved in community events/organizations, such as St. James AME Church, the NAACP and Delia Lane’s Women’s Missionary Society. When she is not working, Michele loves doing work for the community with her kids in tow. She loves spending time with her kids and working on her business. And, of course, getting in some much-needed girls’ time. We’re so thankful to have Michele part of the SERVPRO of Cape Girardeau & Scott Counties’ team. 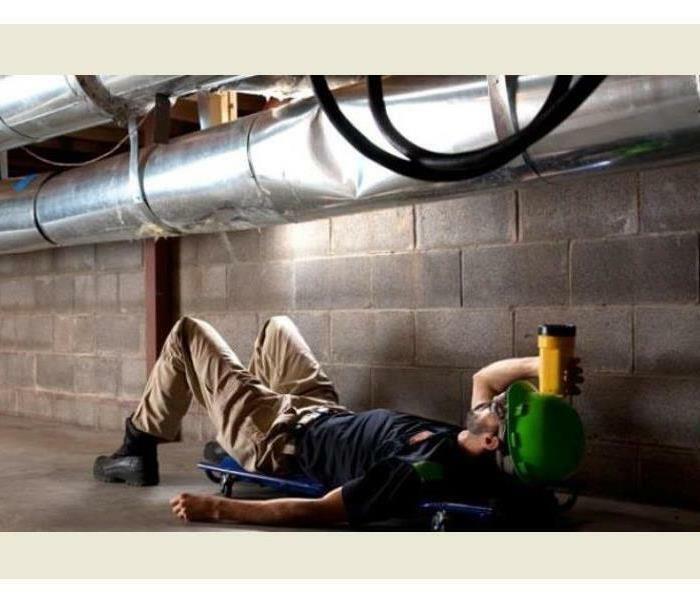 Scott Haskell is a Production Technician here at SERVPRO of Cape Girardeau & Scott Counties. He joined our team in September 2018. Scott has two lovely daughters: Erin Sitz and Chantel Reeder. When he’s not at work being a hero to help get homes and businesses back to “Like it never even happened,” as a result of fire or water damage, he enjoys fishing, hiking, reading, playing his guitar, watching sunrises and sunsets, gardening and landscaping. He likes to meet new people and stimulate conversations. He loves his girls dearly and loves to spend quality family time together. Plus, he’s a huge Green Bay Packers fanatic. We’re glad to have Scott part of the SERVPRO of Cape Girardeau & Scott Counties' team of heroes. Brandon Duty is a Field Business Consultant (FBC) here at SERVPRO of Cape Girardeau & Scott Counties. He joined our team on October 29, 2018. Brandon has a lovely daughter by the name of Madee Claire. He also has two Doberman’s. One’s name is Kane Allen, and the other name is Quinn Elizabeth. Outside of work, Brandon enjoys spending time with his family first and foremost. He also enjoys playing golf (when possible), playing slow pitch softball, and spending probably too much time at the gym working out and exercising. He said music and gym time are his therapy. 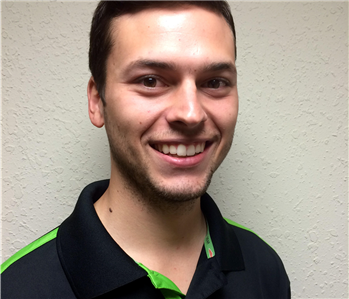 We’re happy to have Brandon part of the SERVPRO of Cape Girardeau & Scott Counties’ team.